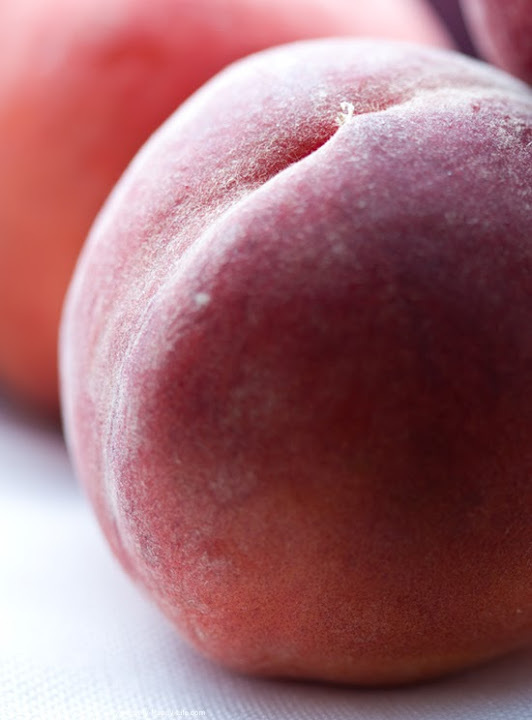 Peaches and Banana Cream Pie Recipe. Dreamy. Vegan. 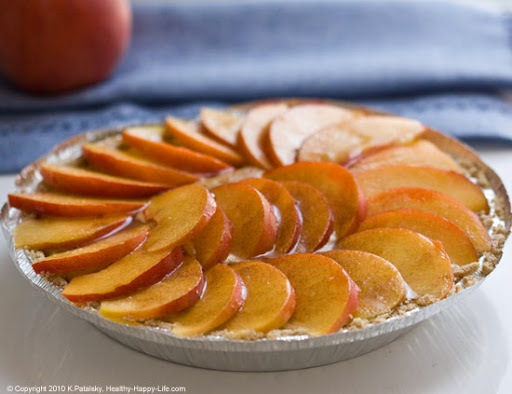 This Peaches and Banana Cream Pie vegan dessert is my toast to one of my favorite summer fruits: golden, juicy, fuzzy, dreamy peaches. Simple Summer Recipes. My favorite summer desserts are simple, elegant, fresh and fuss-free. 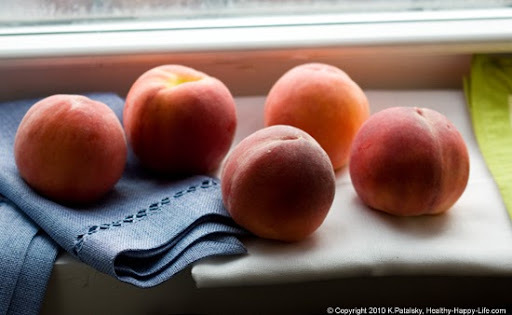 So for this recipe, I let the flavor of those perfectly simple juicy peaches guide my creation. Summer Fruit Desserts. 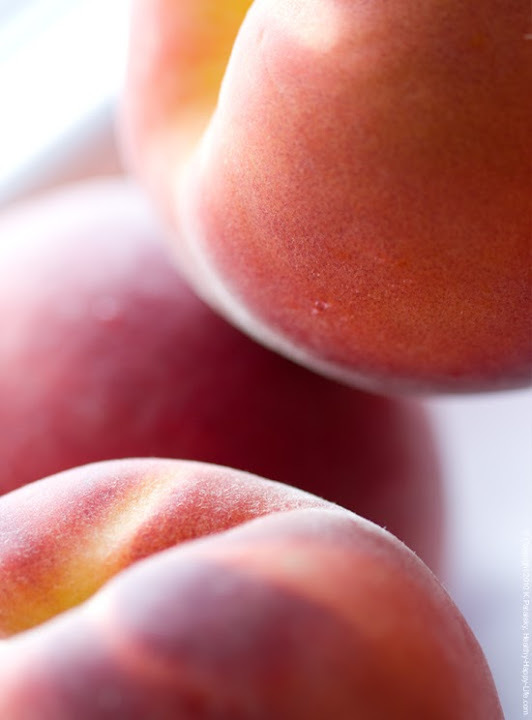 Summer fruit is delicious on it's own - that's why I like to keep berries, peaches, apricots, cherries as fresh and raw as possible in my summer desserts. 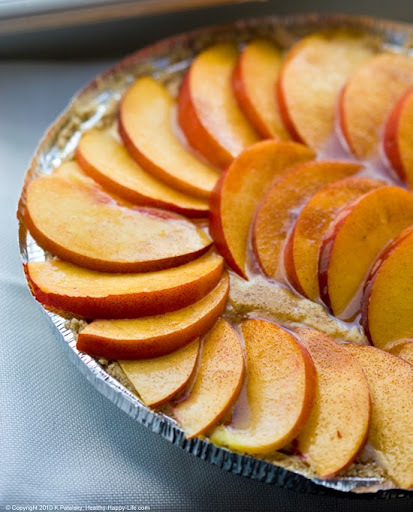 Fresh strawberry pies, fresh cherry pie-fait's and now this fresh Peaches and Banana Cream Pie. 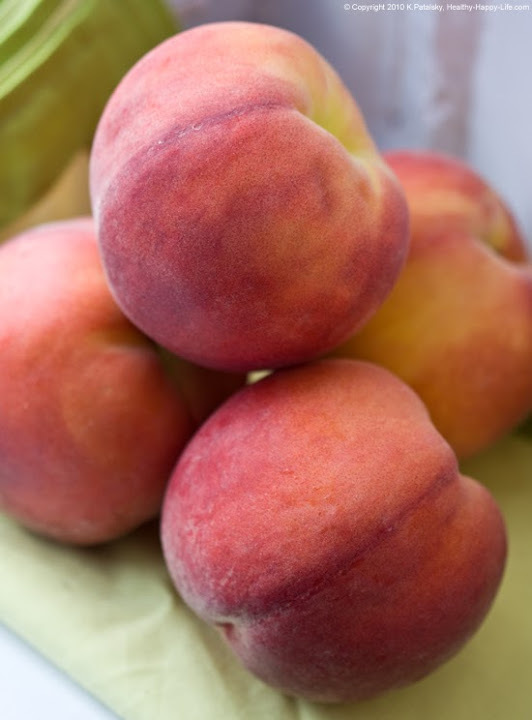 Summer peaches are dreamy. And healthy. 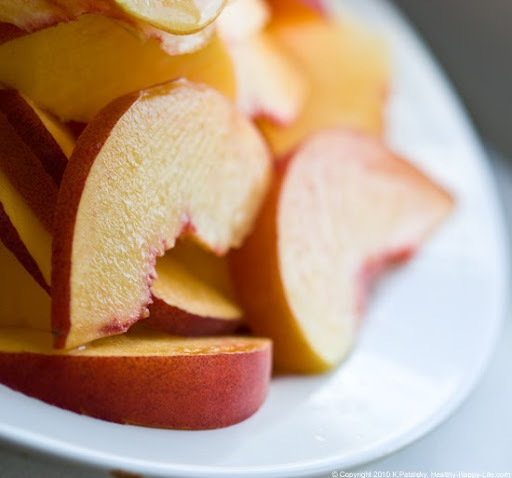 Healthy Peaches. 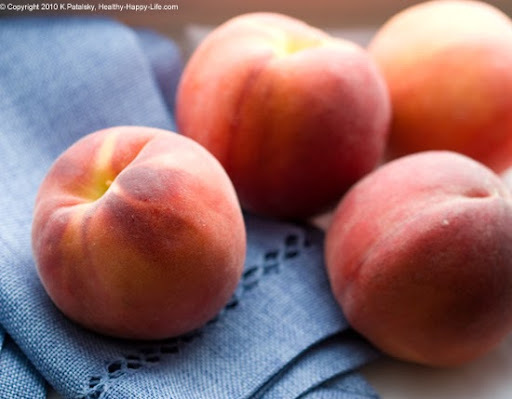 Peaches are divine - - and super healthy. 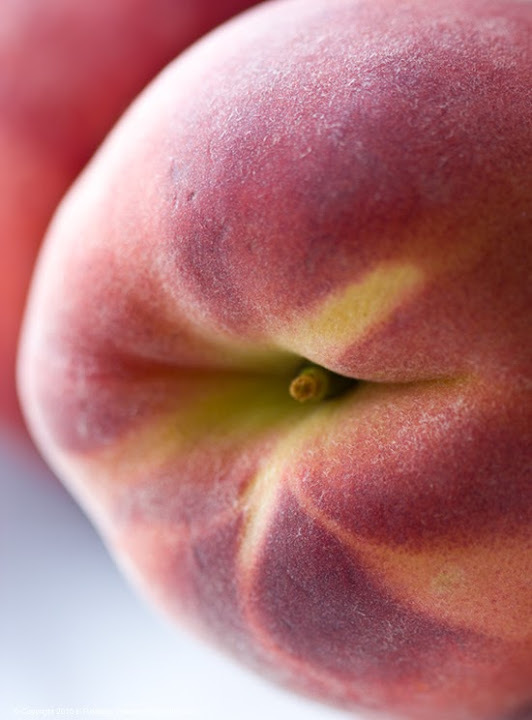 One large peach has only around 40-70 calories (every peach is different) and is loaded with hydrating juice and healthy fiber. 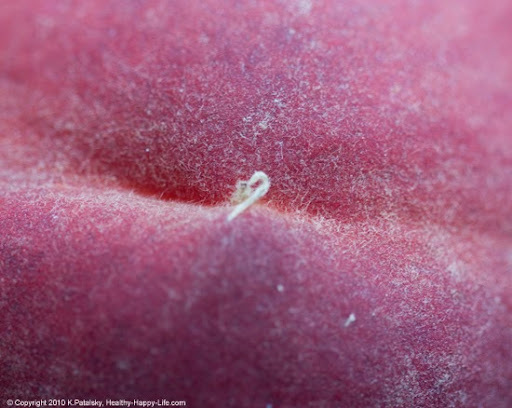 Vitamins C and A are also packed under that fuzzy skin. you also get a nice boost of potassium, copper and vitamins E and K. source. Serving. This pie is quite soft to serve. This is another one of my "pie-fait" desserts where I prefer to serve the pie in a dessert bowl or short parfait glass instead of on a plate. I like the presentation of a 'pie' - but unless you add in a few extra firming ingredients like arrowroot powder, corn starch or agar - this pie will be of the soft side. Chilling overnight will help the firming process as well as using a wide dish so that the pudding layer is shallow. But really, I am quite fine with the pudding-esque consistency. 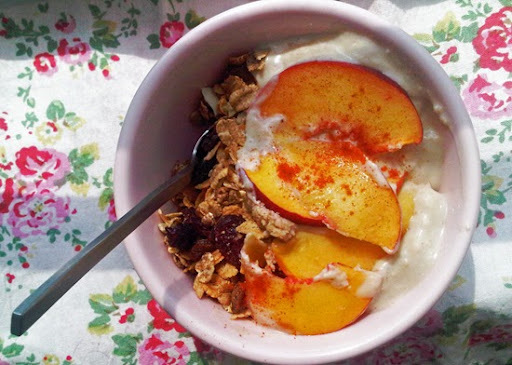 Peaches and banana cream - yum!!! Tasting Tips: After tasting the finished product last night I loved the silky flavor of the banana cream pudding. Luscious and flavorful. 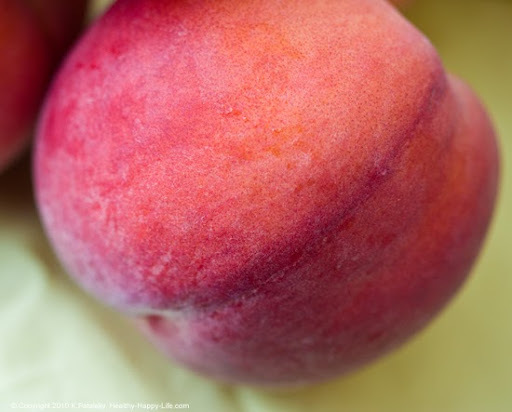 The peaches were sweet and juicy - I found the extra-thinly sliced peaches melted into the cream layer perfectly. 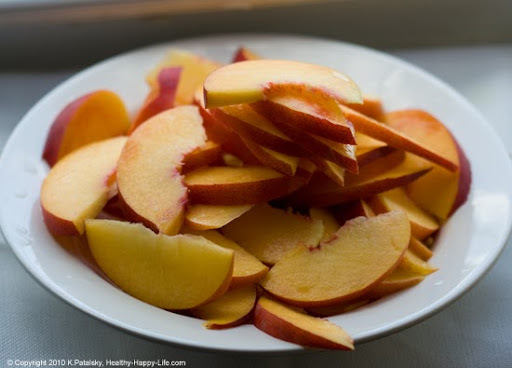 My tips: slice the peaches extra thin! And also, (optional) add a few graham cracker crumbles and/or granola over top the peaches - when you serve the dish. This will soak up some of the excess peach juice. 1. 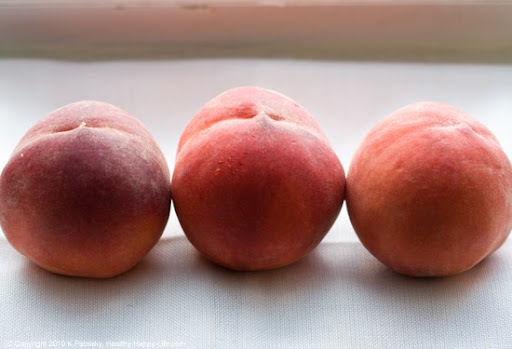 Slice your peaches and soak them in lemon juice - from one squeezed lemon. Optional: add a bit of maple/agave to this soak too. You can even add a pinch of sea salt if you'd like. Set aside. 2. Turn on stove. In a soup pot add the soy milk, pudding mix, silken tofu, 2 bananas (lightly smashed), cinnamon, vanilla, vegan buttery spread and salt. 3. Stir continuously until the mixture bubbles and boils. About 4-5 minutes. It will be lumpy from the tofu and bananas. 4. Remove from heat and add the juice of one lemon (chilled preferably to cool off the mixture a bit before blending). Transfer the mixture to a blender or food processor. Blend until smooth and creamy. 5. 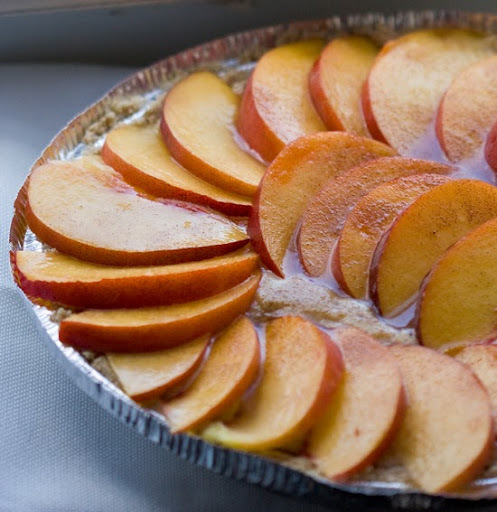 Grab your graham cracker crust and pour the banana pudding mixture into the shell. 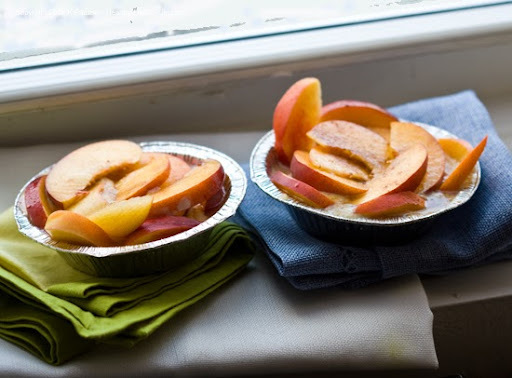 Pour leftover mix into small mini pies or make fresh fruit parfaits. 6. 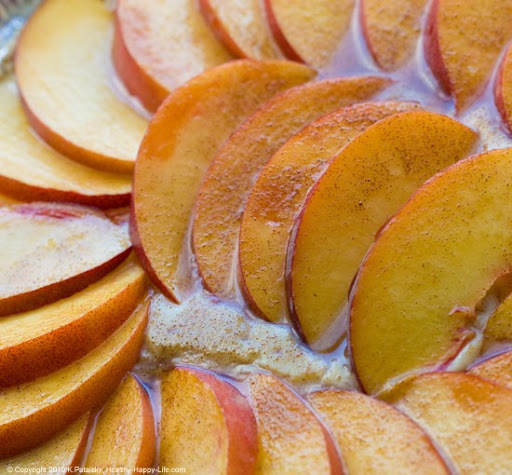 Elegantly layer your sliced peaches over top the pudding. 7. 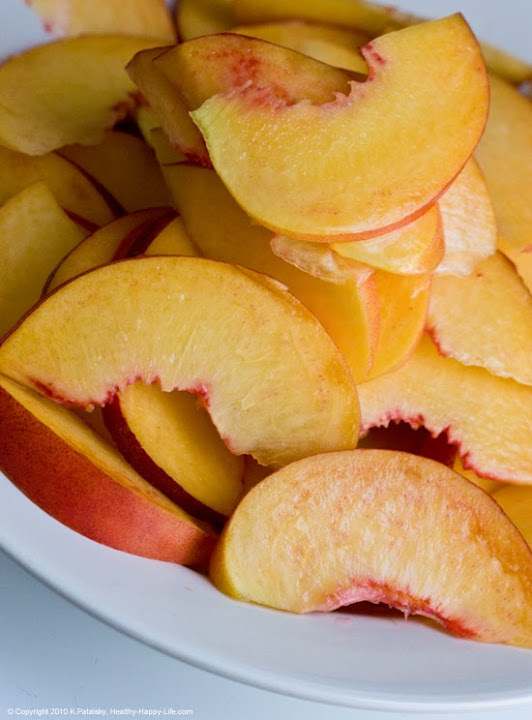 Drizzle the maple or agave syrup over top the peaches. Add a few dashes of cinnamon sugar over top as well. 8. Let chill overnight (or at least 2-4 hours). Serve in a dessert bowl. *these were the mini pies I made with the leftover filling. Re-used old pie tins.